At JOHN DREW BRANDS, we like to destroy everything! Yeah, I said it… “DESTROY”. With an attitude that’s never satisfied with the status-quo, we’ve been redefining craftsmanship since 1996… and that’s precisely the spirit that we’re bringing to the table with the BRIXTON MASH DESTROYER. What exactly is Brixton Mash Destroyer? Think of it as a mash up collaboration between high quality spirits, such as KENTUCKY BOURBON & FLORIDA RUM. It’s in the very bottle that you’re about to experience. The key to this process begins with our well aged, craft sourced, core products. Since we are an NDP (Non-Distiller Producer), we depend on strategic partnerships with respected distillers to achieve our goals. Each of our distillers then ship the juice to Florida Caribbean Distillers in Florida for maximum quality control. The blending process comes next, where we wisely finesse our core, high quality spirits into new taste profiles. We have created a number of new BMD blends for you to experience, but this ‘BOURBON & RUM‘ expression is the first to hit the market. From the time I founded my little handmade cigar factory in 1996, we never asked for permission to craft any of the blends that turned Drew Estate into the second largest in the world – we just got up early and worked hard every day. There was a crew of us together in a foreign land, collaborating to make a difference. And I truly believe that we created something beautiful that changed the game forever. 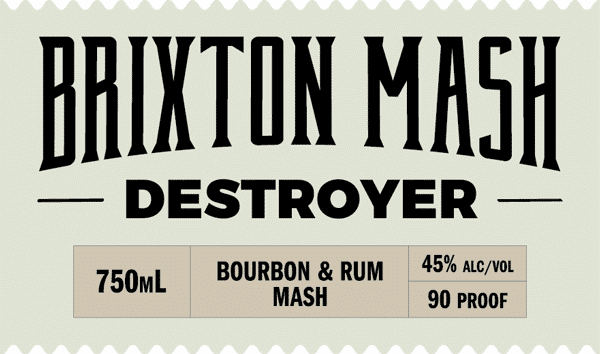 Each blend of BRIXTON MASH DESTROYER (BMD) is crazy good in a mixed drink as well… trust me. Kentucky Bourbon that’s been mashed with Florida Dark Rum for an experience unlike anything ever created. Not better… just crazy different and smooth. Definitely a JD Classic Project.